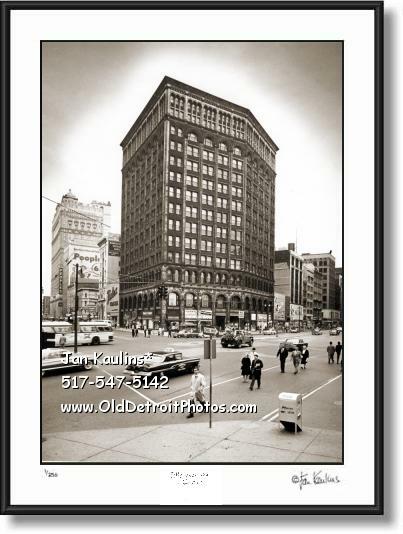 MAJESTIC BUILDING DETROIT photo picture photography print for sale. DETROIT MAJESTIC BLDG photo picture prints photography for sale. This sepia toned DETROIT MAJESTIC BLDG photo print is made from the professionally restored original 1961 black and white negative/print. It is a fine portrait of this historic Detroit structure that was located at Woodward Avenue at corner of Michigan Avenue. To the left of this large structure we can see the historic Book-Cadillac Hotel. The Majestic Building was a high-rise building in Downtown Detroit, Michigan. It was located at 137 Woodward Avenue. The building was constructed in 1896 for the Mabley and Company department store chain and was the city's second skyscraper, following the completion of the Hammond Building. It contained 14 stories and stood at 223 feet in height. This building was designed in the Beaux-Arts style by Daniel H. Burnham & Company, and faced with terra cotta. The final construction cost of the building was $1,000,000. This was Detroit's tallest building, from its completion in 1896 until 1909, when it was overtaken by the Ford Building. Unfortunately, C. R. Mabley died before the building's completion and new owners used it solely as an office block. It was purportedly renamed the Majestic building to conform with the letter "M" (for Mabley) carved in numerous places in its facade. It was demolished in 1962 to make room for the new FIRST FEDERAL SAVINGS AND LOAN BUILDING, which was completed in 1965.